The three biggest trends in weddings today are simplicity, personalization, and color. Wedding design expert Karen Bussen highlights these elements as she shows couples how to design their own weddings without going crazy or broke. 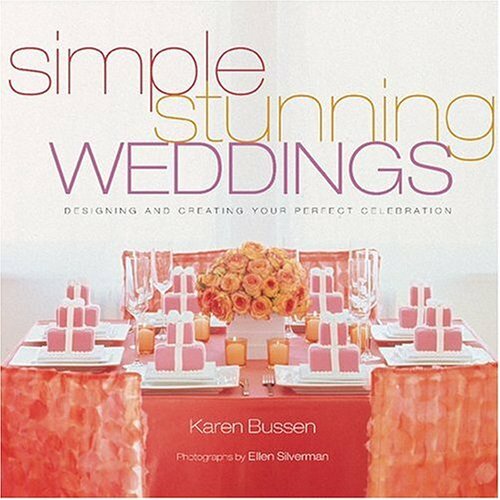 Simple Stunning Weddings is the first wedding design book to focus on the where of the wedding. Location is the first and most important decision brides and grooms must make: everything else flows from that. Bussen showcases 12 popular wedding settings, including the city loft, country inn, art gallery, botanic garden, and private club, and demonstrates how to make them extraordinary. With the site as the starting point, she creates unifying themes with color, flowers, and personal touches. She explains how to deal with vendors, how to spend the wedding budget, and when it makes sense to hire a specialist. Sharing all her trade secrets, Bussen teaches the power of simplicity and the impact of color, which can be tailored to any budget, always to stunning effect: substituting cotton tablecloths for silk in the same eye-dazzling color combinations, for example, or creating striking flower arrangements using only one or two types of blooms. Whether for a barefoot union on a beach or a formal affair in a hotel ballroom, this fully illustrated, information-filled book is like having Bussen on hand as your personal wedding designer. AUTHOR BIO: KAREN BUSSEN is one of Manhattan's most exciting wedding designers. Her work has been featured in such magazines as Modern Bride, Martha Stewart Weddings, Home, Food & Wine, and Interior Design. In the past six years, she has designed more than 100 weddings. ELLEN SILVERMAN's photographs have appeared in Charmed Bracelets and New Soul Cooking (both STC). KAREN BUSSEN is one of Manhattan's most exciting wedding designers. Her work has been featured in such magazines as Modern Bride, Martha Stewart Weddings, Home, Food & Wine, and Interior Design. In the past six years, she has designed more than 100 weddings.